2015 registered cars – knock down prices! All of Imperial Car Supermarkets prices on our used cars are researched daily to ensure you are getting the best deal for the age, model and service provided, meaning that we offer the very best used car deals in the UK. Many of the cars we sell have been registered during 2015, and the savings on buying one of these RAC checked, used cars is quite simply HUGE! 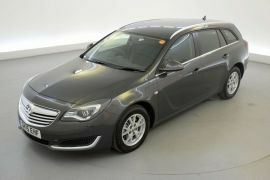 Take this Vauxhall Insignia 2.0 CDTi ecoFLEX Design Nav 5dr, it has just 782 miles on the clock and comes in at £16500, a saving of over £5324 on the original selling price! Cars like this had their hard hit of depreciation when they originally left the car showroom. Now they are for sale with Imperial Car Supermarkets at incredible prices. Why not search for more nearly new cars (all under 18 months old) here for you next used car deal? Don’t forget we also offer an array of tailor-made finance deals. Come to Imperial Car Supermarkets in Southampton, Northampton, Portsmouth or Fleet and you could be driving your next car away today.